THANK YOU FOR YOUR GREAT SUPPORT. ONLINE REGISTRATION CLOSED @ 10:00AM FRIDAY 3/1/19--PLEASE COME AND PAY AT DOOR!! This seminar explores a new approach to membership. Borrowing lessons from consumer research on "horizontal segmentation" and targeted marketing, we'll discuss effective ways to reach out to specific groups in the community. We'll explore increasing ethnic diversity by engaging in service projects. Use the Rotary Health Clubs Check to pinpoint problem areas, and discuss possible solutions. And how to use the new flexibility in membership categories to maximize our impact in "doing good in the world." You don't want to miss this! First ever, seminar for members, President-elects, Club Membership Chair and Committee. 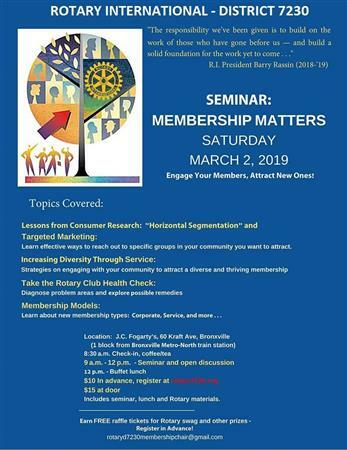 We will present interesting speakers addressing the pressing issues of Rotary club membership in today's environment.Here today, and going forward, the District will be reaching out to each club with help, guidance and assistance in planning and executing Attraction and Engagement strategies. . Program 09:00am to Noon followed by lunch.